Senator Jeff Flake joined Democrats Thursday in calling for more information in Gina Haspel’s role in the CIA’s destruction of 92 video tapes that documented enhanced interrogation techniques used against two terror suspects. Haspel has been nominated as director of the CIA and the Senate is preparing to vote on her appointment. In 2005, Haspel held a supervisory position at the secret CIA black site in Thailand where the videos were filmed and subsequently destroyed. Two U.S. detainees, Abu Zubaydah and Abd al-Rahim al-Nashiri were subjected to enhanced interrogation techniques such as waterboarding, which the CIA documented in hundreds of hours of footage. DigitalGlobe satellite imagery of a the Salt Pit outside of Kabul, Afghanistan on September 1, 2014. The Salt Pit was the codename of an isolated clandestine CIA black site prison and interrogation center in Afghanistan. It is located north of Kabul and was a brick factory prior to the Afghanistan War. The CIA adapted it for extrajudicial detention. Homan Square, Chicago, on February 24, 2015, the location where Chicago police detain Americans at abuse-laden 'black site'. Americans unable to be found by family or attorneys are locked inside what lawyers say is the domestic equivalent of a CIA black site. A soldier closes the entrance gate of Military Air Base nr. 86, near Mihail Kogalniceanu village (250km East from Bucharest), 04 November 2005. On Wednesday, The Washington Post said the CIA was running a network of secret facilities for captured terror suspects in eight countries, outside the reach of the US justice system. The rights group Human Rights Watch said it believed Poland and Romania had cooperated with the CIA based on flight records and other evidence. One of the places mentioned to be used as prison for terror suspects is Air Base 86, which was providing logistics support during the Iraq war and is supposed also to became a NATO base. This picture taken on October 19, 2010 shows the Szczytno-Szymany airport in Szymany. Poland has charged its former spy chief as part of a probe into claims it hosted a CIA 'black site' where suspected Al-Qaeda members were allegedly tortured, a newspaper reported on March 28, 2012. Polish prosecutors launched an investigation in August 2008 into allegations that Warsaw had allowed the US Central Intelligence Agency to operate a secret prison on its soil to interrogate top suspects in the September 11, 2001 attacks. Polish campaigners said in July that they had obtained official records about seven CIA planes -- five of them carrying passengers -- which landed in 2002 and 2003 at Szymany, a Polish military base in northeast Poland. Barbed wire fence surrounding a military area is pictured in the forest near Stare Kiejkuty village, close to Szczytno in northeastern Poland January 24, 2014. Polish prosecutors investigating allegations the CIA ran a secret jail in a Polish forest said on Friday they will look into a newspaper report that gave new accounts about the alleged "black site." Cars pass by barbed wire fence surrounding a military area in Stare Kiejkuty village, close to Szczytno in northeastern Poland January 24, 2014. Polish prosecutors investigating allegations the CIA ran a secret jail in a Polish forest said on Friday they will look into a newspaper report that gave new accounts about the alleged "black site." A car passes by barbed wire fence surrounding a military area in the forest near Stare Kiejkuty village, close to Szczytno in northeastern Poland January 24, 2014. Polish prosecutors investigating allegations the CIA ran a secret jail in a Polish forest said on Friday they will look into a newspaper report that gave new accounts about the alleged "black site." A U.S. soldier, carrying bottles of mineral water, walks past a C-130 Hercules transport plane at the Kogalniceanu military air base near the Black Sea port of Constanta, Romania, 155 miles east of Bucharest in this March 13, 2003 file picture. Poland and Romania, close U.S. allies in ex-communist central Europe, denied November 3, 2005, they were hosting secret CIA prison facilities used to interrogate al Qaeda captives.The Washington Post reported earlier that the CIA has been hiding and interrogating suspects at a secret facility in Eastern Europe, which the paper said was part of a covert global prison system that has included sites in eight countries. A cameraman films a military area in Stare Kiejkuty village, close to Szczytno in northeastern Poland January 24, 2014. Polish prosecutors investigating allegations the CIA ran a secret jail in a Polish forest said on Friday they will look into a newspaper report that gave new accounts about the alleged "black site." A view of the training base of the Lithuanian State Security Department that is suspected to be a former secret CIA prison, October 2009. A suspected former CIA secret torture prison that used to hold Al Qaeda members has been uncovered in Europe. The former riding academy in Vilnius, Lithuania housed up to eight suspects at once according to a former U.S. intelligence officer. A military car passes by barbed wire fence surrounding a military area in the forest near Stare Kiejkuty village, close to Szczytno in northeastern Poland January 24, 2014. Polish prosecutors investigating allegations the CIA ran a secret jail in a Polish forest said on Friday they will look into a newspaper report that gave new accounts about the alleged "black site." The watchtower of a military area is pictured in a forest near Stare Kiejkuty village, close to Szczytno in northeastern Poland, January 24, 2014. Polish prosecutors investigating allegations the CIA ran a secret jail in a Polish forest said on Friday they will look into a newspaper report that gave new accounts about the alleged "black site." “Senator I absolutely was an advocate if we could within and conforming to U.S. law and if we could get policy concurrent to eliminate the security risk posed to our officers by those tapes,” Haspel responded. 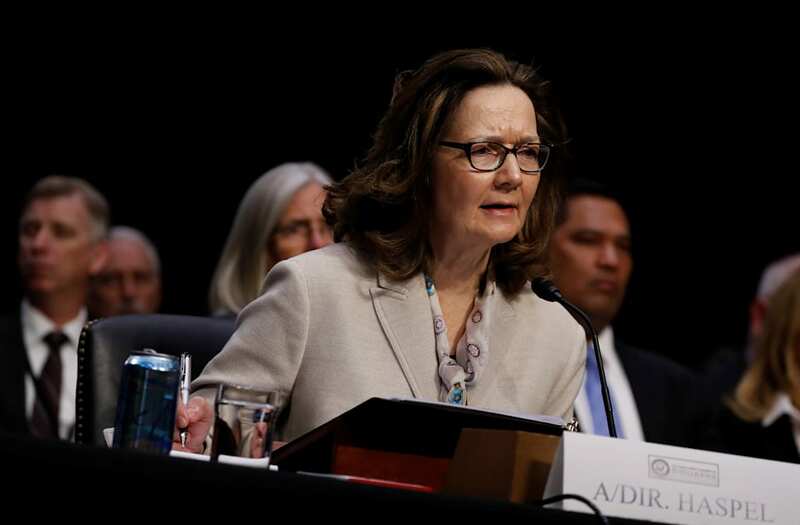 At the same time, however, Haspel said she never watched the tapes herself, but realized that their contents were so graphic that their release would endanger the CIA officers who carried out what has since been deemed to be torture.